A group of San Francisco high school students will wrestle with tricky ethical questions during a competition this January, with help from SF State philosophers. Seven graduate philosophy students are serving as coaches for high schoolers at San Francisco's School of the Arts and the Academy of Arts and Sciences who will be competing in the High School Ethics Bowl next January. This is the second year SF State students have been involved in the competition. 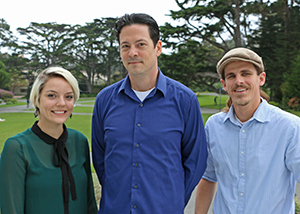 Ashlie Meredith (from left), Matt Howery and Eric Clanton are among several SF State graduate philosophy students serving as coaches for San Francisco public high school teams competing in the High School Ethics Bowl. "I have never seen people so interested in these questions before," said Matt Howery, one of the coaches and the SF State outreach coordinator for the National High School Ethics Bowl. "Especially in San Francisco, teenagers are passionate social justice ninjas. These are things they care about." Last year, Howery's team made it all the way to the regional semifinals, an impressive achievement for a public school with fewer resources than many of its competitors. For the SF State students, Howery added, giving back to the community in this manner is a natural and important part of what they do as philosophers. "A philosopher is a teacher," he said. "Philosophy is teaching. It's not a field that exists if no one is sharing information. Anytime we are engaging people, especially people who are not philosophers, we are engaging in an art that is thousands of years old." The seven coaches are supervising six teams of five students each, working with them for a few hours each month to teach them how to develop arguments and engage others in collaborative debate -- the criteria by which they will be scored during the competition. The regional competition in January will be held at University of California, Santa Cruz, with the winner advancing to the National High School Ethics Bowl in North Carolina. Topics will include whether it is okay for a country such as Brazil to spend billions hosting the World Cup while many of its citizens are starving and whether photoshopping magazine models is ever appropriate. "I've been pleasantly surprised at how quickly the students take to philosophical arguments, the kinds of objections that they raise and their philosophical development," said Ashlie Meredith, a graduate student and coach. "Watching that has really cultivated a passion in me for bringing philosophy to young people. It's important to foster their critical thinking skills so they can learn how to develop their own opinions and become informed citizens." The SF State students' involvement is essential because it provides the high school students with a historical and academic context for the skills they are learning, said Jerry Pannone, a retired teacher and the ethics bowl coordinator at the two high schools. "That is really enlightening to the kids, to see that these are very well-founded ethical theories that can also be in conflict with each other," Pannone said. "The SF State students can elucidate that for them and show them the classical development of an argument where you have two or three premises and a conclusion. That is excellent for students to learn."